No. 36 was new to Lincoln City Transport in March 1980, one of a batch of three long wheel-base VRs with fully automatic gearboxes, following a batch of East Lancs bodied short wheelbase VRs the previous year. No. 36 was, in common with the rest of the LCT fleet, fitted with 'Autofare' equipment from new. No. 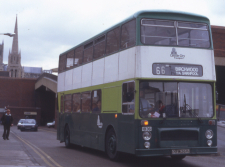 36 carried a variety of liveries with Lincoln City Transport, being new in a green livery with a single cream band (similar to the mid 1940s livery), this was followed by a brighter livery of mainly cream livery with three green bands. Deregulation brought a white based livery with three narrow green bands. 1992 brought a livery of three shades of green plus white, along with the removal of 'Autofare' equipment, LCT adopting Wayfarer ticket machines and ending the 'exact fare only' policy. Along with the rest of the LCT fleet at the time, No. 36 passed to Lincolnshire Road Car in 1993, becoming fleet No. 1836 and receiving Road Car's green, yellow and white livery. As Road Car standardised on Leyland Olympians and Atlanteans for its double deck fleet, its VRs were sold, No. 36 (with similar No. 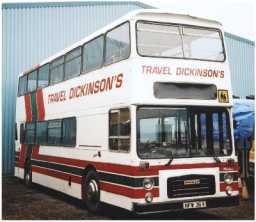 39) passing in 1995 to Dickinsons of Wrangle, for use mainly on a schools service connecting Wrangle with Boston and Old Leake Schools. With Dickinsons, No. 36 acquired the name 'Mikey', was re-trimmed with moquette covered seats, and received decorative wheel trims. It has also been converted at some stage to the more conventional semi-automatic transmission. No. 36 was 'retired' from service in 2005, and, thanks to donations from a few Society members, was purchased from Dickinsons by the Society, and arrived at Whisby Road on 3 November 2005. 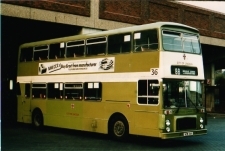 NFW 36V in service as Lincoln 36, City Bus Station, early 1980s, in original livery. 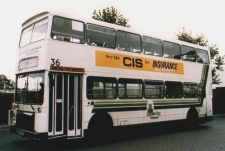 Another view at City Bus Station, early 1980s, in the post 1981 livery. Post 1985 Lincoln City Transport livery. Again, at City Bus Station. Final (1992) Lincoln City Transport livery, with Lincolnshire Road Car fleet number plate and LRC route number for Birchwood service - leaving City Bus Station. No. 36 was the last of Lincoln's VRs to remain in service in original form - No. 39 was withdrawn from service after an accident, No. 38 has been exported to South Korea, and the only other survivor, No. 37, had a comprehensive interior refit and was used as "The Big Blue Party Bus" in the Bath area - it is understood now to be a mobile home in the Hebrides. January 2010 - A 'deregulation' destination blind has been received from the Manchester Museum of Transport with thanks. It is now in place and we are looking for a set of correct style of numbers to finish the job off. The cab area is currently being tidied so eventually it can be utilised for children to sit in - we do receive lots of requests for this type of facility. It would be good to give the bus a 'quick' make over to smarten it up in maybe 'deregulation' livery before long. Any offers of help will be greatly received! July 2010 - Water hose clips have been renewed due to a severe water leak . October 2010 - The cab area is responding well to some renovation and paint and looks good. 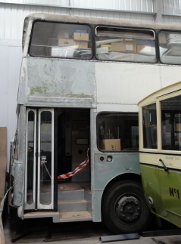 Archive material from storage in TF 818 (the Leyland Lion) has now been moved into the bus. January 2011 - One step back with the 'make over' is the that the entrance floor frame needs some welding. January 2012 - More prodding around the cab floor area has revealed the need for much welding to the chassis outriggers etc and new flooring. Work is planned to commence early in the new year. The plan for Lincoln 36 is to smarten it up externally and to use it as a display in the museum, inviting children to sit in the cab, alter the destination blind etc. July 2012 - Family team John and Jordan continue to make good progress rubbing down the exterior paintwork with the majority of the nearside now prepared. The cab area floor is pretty grim and will need some expert attention (and money!) though. Eventually it is hoped that this will be available for children to sit in, and 'play' bus drivers etc, and displayed in a post deregulation livery. Thanks to the Manchester Museum of Transport lads, it now carries an authentic destination blind of the period. April 2013 - Lincoln Corporation 36 has £3,000 allocated following the November Open Day, and we would like to tidy it up for the 110th anniversary of Lincoln Corporation Transport in 2014. Further donations to this fund are most welcome. The front end needs lots of work, mostly difficult welding and fabrication, as well as a body repaint. April 2014 - Following donations towards this project, professional help has been brought in to replace the front nearside outriggers around the platform area and fit a new floor. 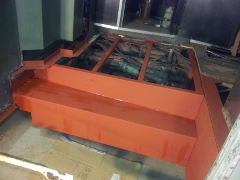 New 'Treadmaster' covering will be fitted shortly. April 2016 - The rear saloon floor has been removed so a start can be made on repairing the badly corroded chassis, while progress is being made with repairing the equally rusty offside emergency door. This vehicle will need a lot of work before it is fit to run again, so more help is very welcome.